A common fungal family called dermatophytes causes ringworm. The fungus can infect any area of the body where there is skin, hair or nails, and the infection is named for the part of the body that it infects. The parasites do not need light to survive, unlike “green” plants. Left untreated, a ringworm infection can cause mild to serious complications. Dermatophytes feed on keratin, the predominant protein in dead skin cells, hair and fingernails and toenails. When the fungus infects the scalp, it is called “tinea capitis.” The fungus causes a rash to appear on the scalp that most often is circular and expands over time. The rash is usually reddish or gray, and can include scaly patches of skin. Hair within the patch area is brittle and easily breaks off near the scalp or pulls out. Young children, primarily girls, contract ringworm of the scalp, possibly through sharing of brushes or hair clips. Because it is highly contagious, the fungus is easily passed from child to child. When cases of tinea capitis are severe, the fungi infect skin at a deeper level, into subcutaneous tissue, and a complication called “kerion” can result. Kerion is an area where the scalp appears spongy. A pus-filled cavity develops along with inflammation. Smaller pimples can appear over the area. A kerion can burst, causing pus to drain from the spot. Scarring and permanent hair loss can result. Dermatophytes can be found on normal, healthy skin. They cause problems only when they can find a way past the skin’s natural protective barriers. They infect nails and the nail bed when they gain access through tears, even microscopic ones, in the skin around the nail, under the nail or in the cuticle. The formal name of the infection is onychomycosis, or tinea unguium. The Merck Manuals reports that approximately 10 percent of people will have onychomycosis. In mild cases, the nail becomes discolored. In severe cases, the affected nail becomes deformed and the integrity of the nail itself is compromised resulting in crumbling, scaling nails. 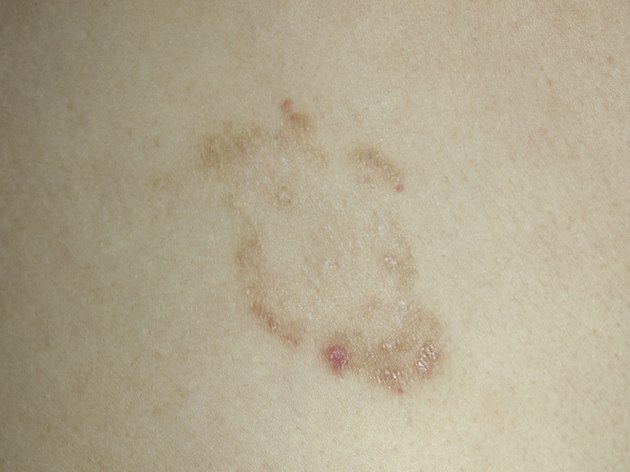 A ringworm infection usually results in a rash, often with an element of scaling. Small tears often occur in compromised skin, allowing bacteria access to the body. Secondary bacterial infections are common complications of ringworm infections. Staphylococcus and streptococcus bacteria are normally present on healthy skin. They enter skin through tears in skin or through a compromised skin acid-mantle, the chemical barrier on skin that normally repels pathogens. Staph and strep skin infections are called “cellulitis.” Medline Plus, a service of the U.S. National Library of Medicine and the National Institutes of Health, reports that fever, fatigue, pain and tenderness are common symptoms of cellulitis. In severe cases, meningitis, gangrene or bone infection may result.